The ideal city break for the traveller to discover contemporary art and a beautiful city in one weekend. 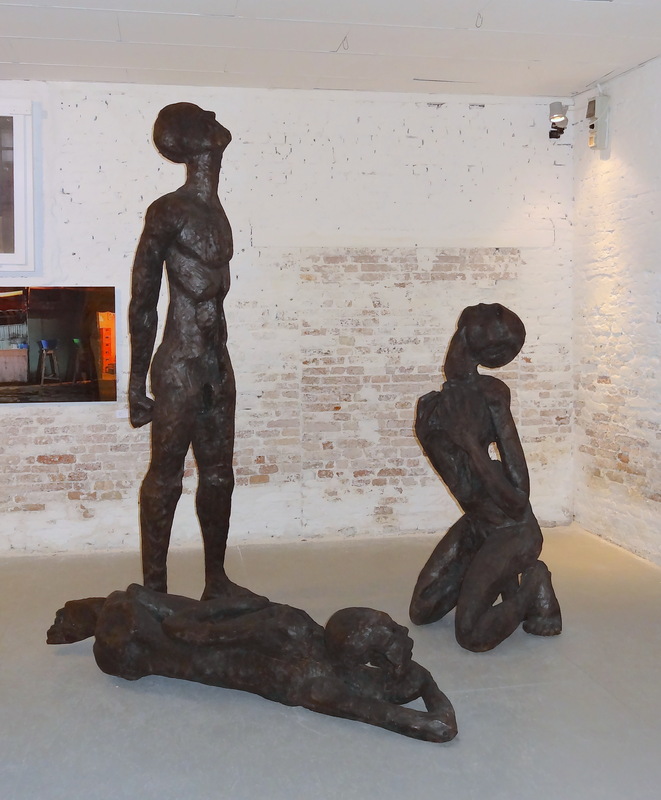 This year’s 55th biennial art fair in Venice, ‘Il Palazzo Enciclopedico’, is on from 1st June through 24th November 2013. 50 ways to make the most of the weekend. First and foremost: Pack light. A backpack is far easier to take around Venice, especially when manoeuvering around the (usually American) numpties with wheelie bags full of their entire wardrobe. Even so, remember to pack your round-pin European adaptor, so to avoid adding to the collection of 37 you already have in a drawer at home. Gadget-geeks can get a sneak preview of what’s going on with an app for your smartphone, such as MyBiennale Guide pro (£1.49) in iTunes Store, which includes information about the artists, highlights, events and general info for Venice. If you are a student, take your student ID and/or NUS card – it saves you over 50% discount for the entry to the paid venues! The official guidebook for ‘Il Palazzo Enciclopedico‘ is pricey (£85). Maybe go halfsies with a friend, or find used versions on Amazon, eBay or even your local library. If you want a printed guide book but you’re skint, the £15 paperback in the Biennale bookshop is good value (it doesn’t seem to be available on Amazon); refer to the £85 two-volume version of “Il Palazzo Enciclopedico” for free in some place such as your local council library or a university library. Also try the Tate Reading room; they have loads of resources about art and artists in the Biennale. Don’t forget to check out the city spaces – they’re free, you’ll often see the weirder (art speak: “riskier, edgier”) stuff here, and some countries are displaying work in the Biennale for the first time. Work by Jems Robert Koko Bi in Cote d’Ivoire pavilion, one nation participating for the first time in the 55th Venice Biennale. Find something else to do on Mondays as the Biennale is pretty much closed. Wandering around looking at the outside of buildings is a fun option. If you only have two days at the Biennale, take a half day each at the main venues, Giardini and Arsenale, leaving a couple of hours in the afternoon to see some of the city venues (but don’t ignore Venice completely; it’s not an ugly city after all). Take lots of pictures of the art (and the venues) – but always without flash. Don’t forget to take pictures of the plaques along with the artwork – a quick and easy way to take note of what you’ve seen, ’cause believe me, you’ll never remember who made the cool painting of glowing phallic cross. (I still haven’t found the artist). 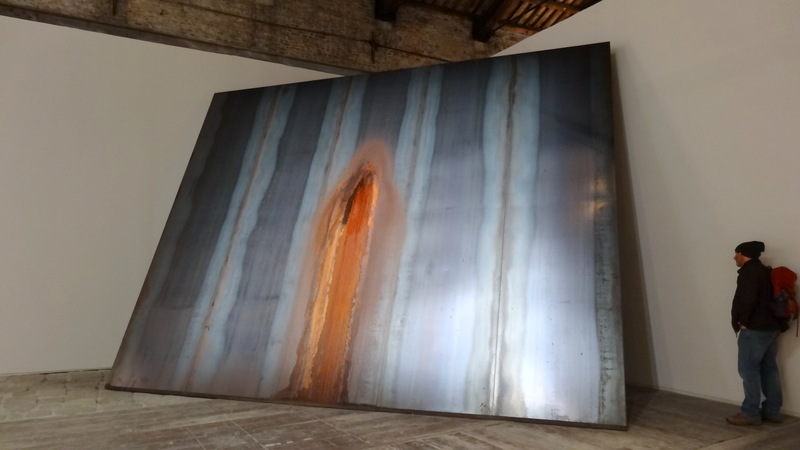 Francesca Gilli, ‘Fe2O3 Ossido ferrico’, 2013, iron oxidised by dripping water, site-specific installation in the Italian pavilion, in Arsenale, Venice Biennale 2013. By the way, Italy has two pavilions – Venice (in Giardini) and Italy (in Arsenale). Since they’re hosting, they’re allowed. Suggest get to the main venues near to opening time (10:00) if you want to enjoy the art with fewer people in your photos. Then do the city pavilions in the afternoon when Giardini and Arsenale venues get busy. The cafés inside the main venues don’t have much to offer by way of food, so if you fancy something other than an uninspired panini, bring a picnic lunch. There is a coat check room at each main venue, so you don’t have to carry your picnic lunch all day. Share the experience! Even non-arty people will have plenty to say about what they see; my partner and I had quite a debate about art and biennial art fairs which really started with this Ted Talk by artist and educator, Shea Hembrey. 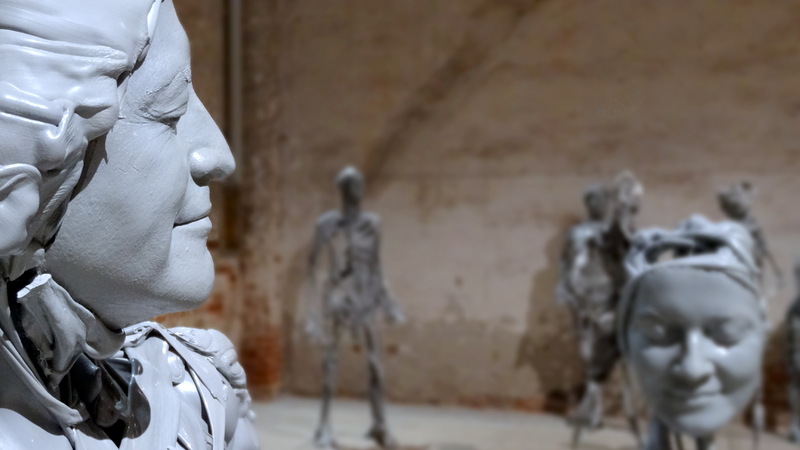 Pawel Althamer, ‘Venetians’, 2013, installation view (detail) in Arsenale at Venice Biennale 2013. 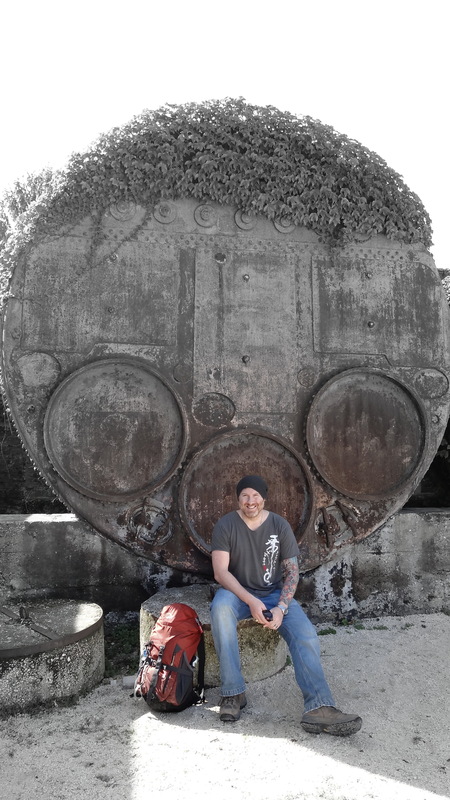 Photo credit Thomas Butler. Enjoy the historic architecture (though sometimes the building can have more character than the art inside). Find at least one piece that really speaks to you and spend at least 10 minutes with it (one of mine was Pawel Althamer’s “Venetians”, above). Take frequent breaks to rest your feet and reflect; there are numerous bars, cafés, and places to sit around the Biennale. Also note, the two main venues have free wifi points if you REALLY really need to upload a picture of your lunch to Instagram. Having a rest in Arsenale. Stilettos aren’t recommended footwear. To heck with style, you are a tourist so comfy walking shoes are the way to go (but please, no Crocs clogs!) And you should prepare for all weather. I dressed for cold rain and had to buy a pair of sunglasses, shedding layers as the day went on. Fondamente d. Fazza – Arsenale, Campo de Arsenale. The Italians love their canine companions, so look out for dog poop. It’s everywhere. That said, look up, enjoy the spectacular views and lovely atmosphere that is Venice all over. It is even possible to find more than one pretty canal bridge not crawling with tourists. because you will get lost at least a couple of times. Maybe a lot of times. 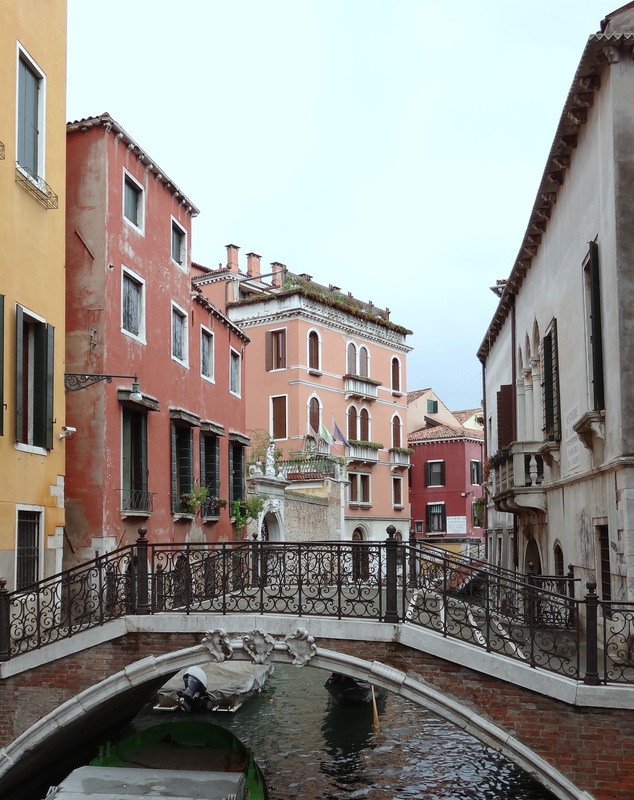 You will enjoy this because Venice is fairly flat easy walking and along the Grand Canal, accessible ramps are installed. Away from the Grand Canal, the bridges are all traversed with steps. A canal bridge in a quiet avenue. Work by Patrizio Travagli, in Maldives pavilion. 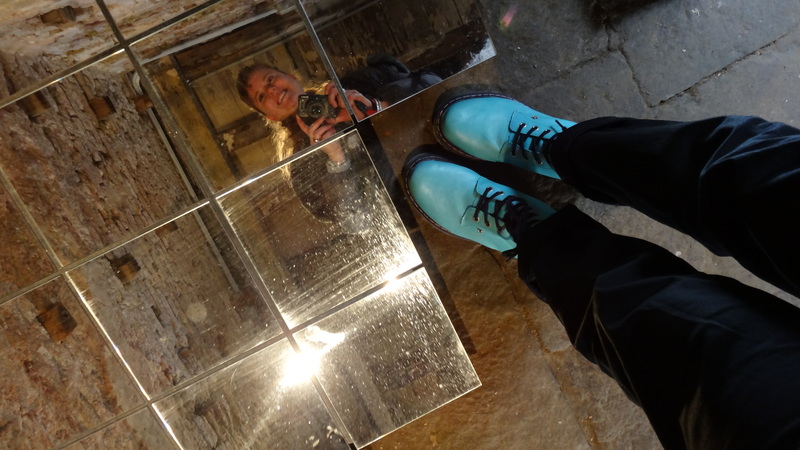 Taking a photo of the mirror tiles as instructed to be sent to travagli.biennale.13@gmail.com. It’s not recommended to show interest in the fake handbag sellers – knock-offs are illegal in Italy and also, if you look twice and ask how much, the vendor may chase you through Venice for 45 minutes, trying desperately to sell you something. On the subject of spending money, tourists that sit down and order cake and coffee without a menu will pay 20%-30% more like a chump. More on that: prices for food, accommodation and services are on par with London, so don’t expect to find a bargain in this part of Italy. View of San Marco square, from the Grand Canal, near Giardini. Speaking of food, it pays to book reservations in advance for restaurants, especially if you want a table between the American tourist dining hours of 6:30 – 8:00pm. A great many restaurants and some cafés are often closed in the afternoon between 2pm and 6pm, so if you’re hungry, have a gelato or try some tourist trap along the Grand Canal. But if dairy’s a problem, remember to pack Lact-aid pills along or plan to only drink espresso. I never saw a Starbucks (not that I was looking), and anyway, nobody has heard of soya milk. A charming view comes with midnight disco party gondolas and incorrigible chompy mosquitoes, especially if your room opens over a canal. The canal outside our bedroom window. Go into a few of the many cathedrals; E.g., in SS Giovanni e Paolo (Cannaregio), for. 2.50 Euros donation you can see lovely religious artworks by Titiano, Bernini and others as you wander around undisturbed, taking as many photos as you like. (Probably best not to go for a tour during Mass times, posted on the door). Interior ceiling fresco in Cathedral SS Giovanni e Paolo cathedral (click image to go to a slideshow). Try the traghetto (standing ferry) to cross the canal. It costs two Euros, takes mere minutes, and yes, you can trust the guy not to dump you in the water. 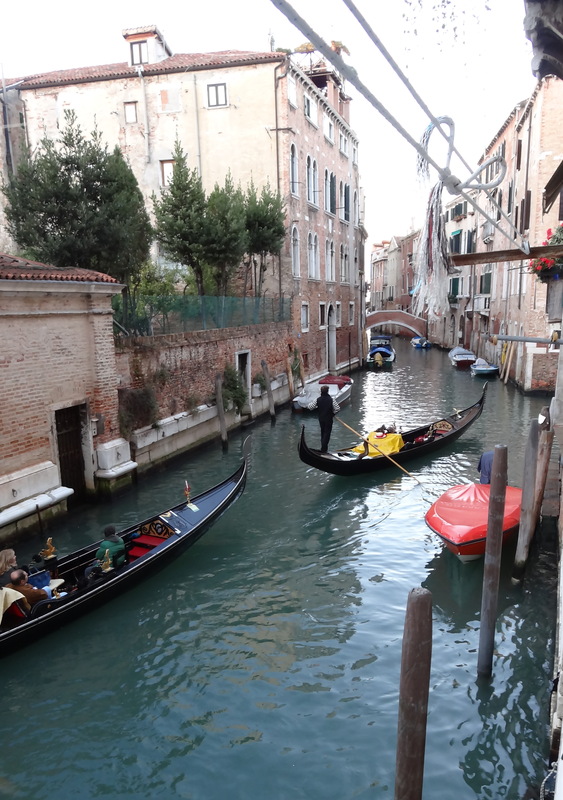 On the topic of gondolas, typically, only Venetians whose father was a gondolier can apply to be a gondolier. Some of them even provide on-board entertainment with their accordion or a song. Alexandra Hai, the first female (and foreign) gondolier in nearly 1,000 years of history won her right to drive the canal boats in 2007, after a brief legal battle. If the scent of Parfum du Canal offends you, avoid July and August. A less stinky Venice is best experienced in early Spring or late Autumn. Flights and hotels are also cheaper during these non-peak seasons. View of Doge’s palace (left) in San Marco square, with San Maggiore in the background. Monday and don’t have anything planned? Spend a few hours at a relaxing spa in central Venice before you leave town. You can buy a cheap swimsuit at Champion sports near Rialto bridge. Sorry gents, it’s Italy, so don’t look for board shorts – it’s Speedos (nut huggers, budgie smugglers) only for you. Please note: nobody, not even guys with Tom Daley body types, should ever wear a thong to a spa or otherwise. Ever. Last tip: most of the shops and restaurants are in some kind of 80s disco time-warp with their piped-in music. If a song by the Bangles is still going around your head, don’t say I didn’t warn you to bring earplugs to Venice. 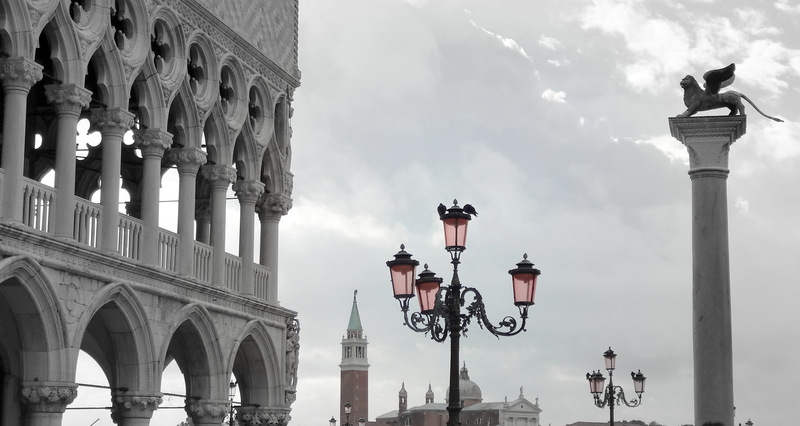 To sum up, in non-Biennale years, I would say Venice is somewhat over-rated as a tourist trap – but when the art fair comes to town, this charming city becomes an amazing place to experience contemporary art. If you don’t make it this year, then maybe in 2015! Click the thumbnails to see picture slideshows from Venice Biennale 2013. All photos in this article credit Kelise Franclemont (except where noted). Event details: The 55th Venice Biennale, “Il Palazzo Enciclopedico”, in Venice, Italy is presented from 1st June through 24th November 2013. Paid admission to main venues (Giardini and Arsenale) and some events, concessions. Free admission to city venues. Hey Kelise! I went to the Biennale last year and I can’t agree more on how big the entire thing is! Love your emphasis on visiting churches and cathedrals!